What is more exciting than waiting for an egg to hatch? Creatures of all varieties begin inside an egg-and those eggs also come in all shapes and sizes. From a squiggly tadpole to fuzzy robin to a leathery platypus, this charming text and unique illustrations show eight different animals as they begin life. 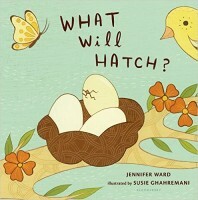 With a cut-out on each page readers will have fun guessing... what will hatch?